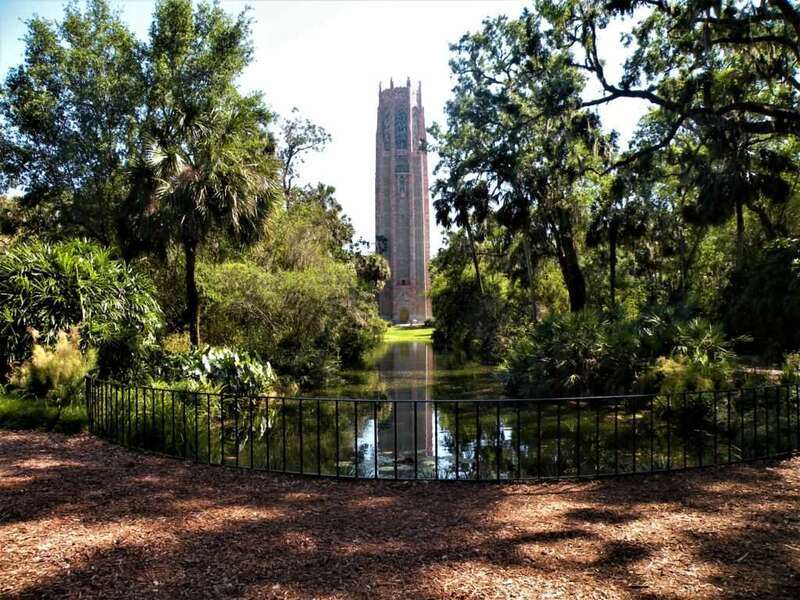 I have lived in Central FL for almost 4 years, and up until this week, I had not visited Bok Tower Gardens. As one of the highest points of elevation in the region, it truly is a landmark– one both tourists and locals marvel at every day. Of course, the tower is the focal point of anyone’s visit (I mean, it’s huge, it’s beautiful and it sings! 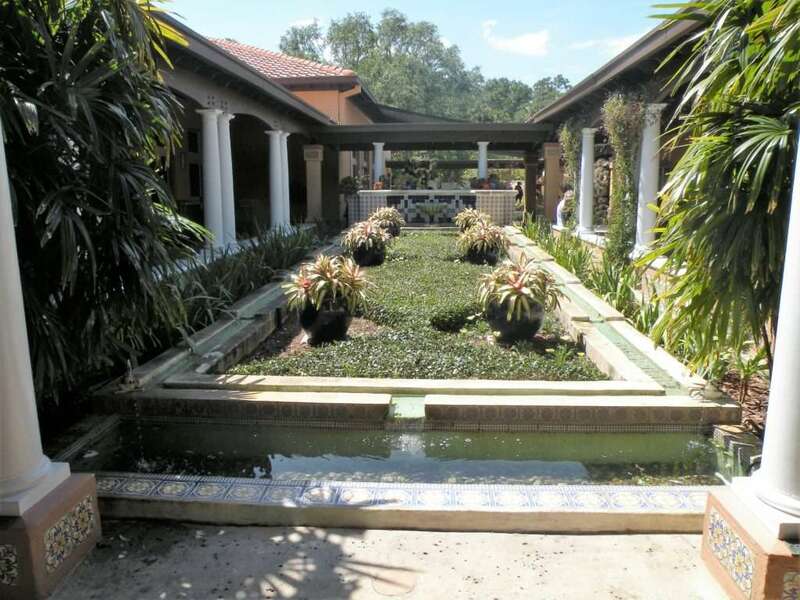 ), but the grounds also feature many beautifully landscaped garden areas and a large Mediterranean style mansion. 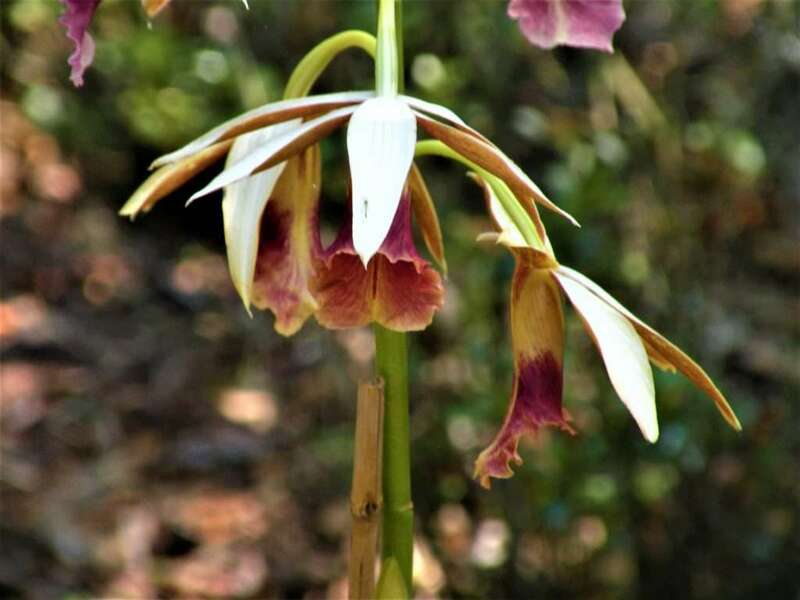 The gardens are also a bird sanctuary, home to over 125 species. As per usual, Brad and I opted to only tour the grounds. We’ll come back and tour the mansion at a later date. The estate was founded by Edward Bok, an immigrant from the Netherlands. When he arrived in America, he did not know any English. He went on to become a Pulitzer prize winning author. Bok was a lover of the environment and all of mankind. He truly wanted to improve the world. 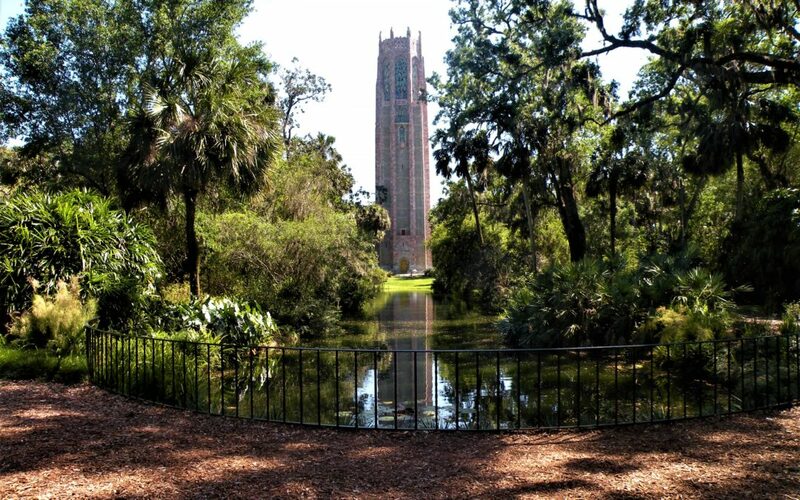 His goal was to make it better by creating what was originally known as Lake Sanctuary and the Singing Tower. 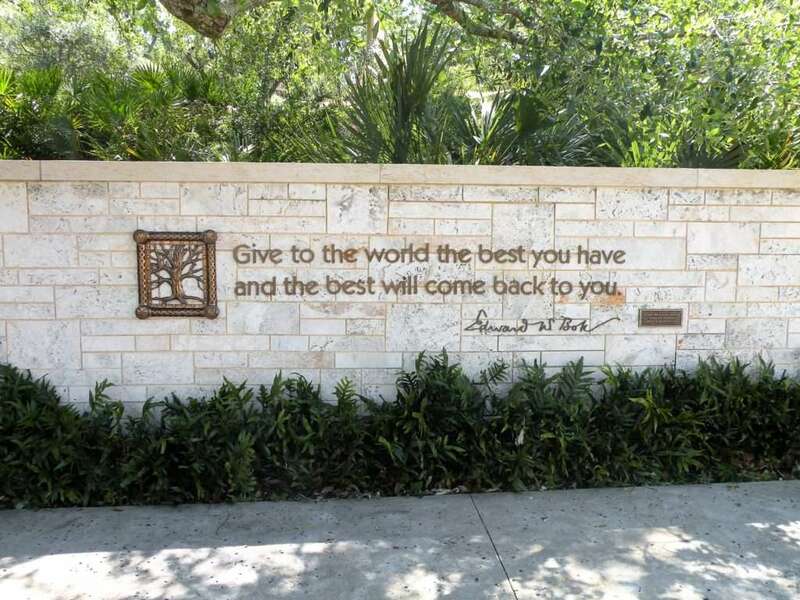 He also wanted to thank America for being so good to him– so he opened the Bok estate to the public in 1929. This lovely water feature is at the visitor center, right before the garden entrance. Brad and I thought that this tree was so neat. 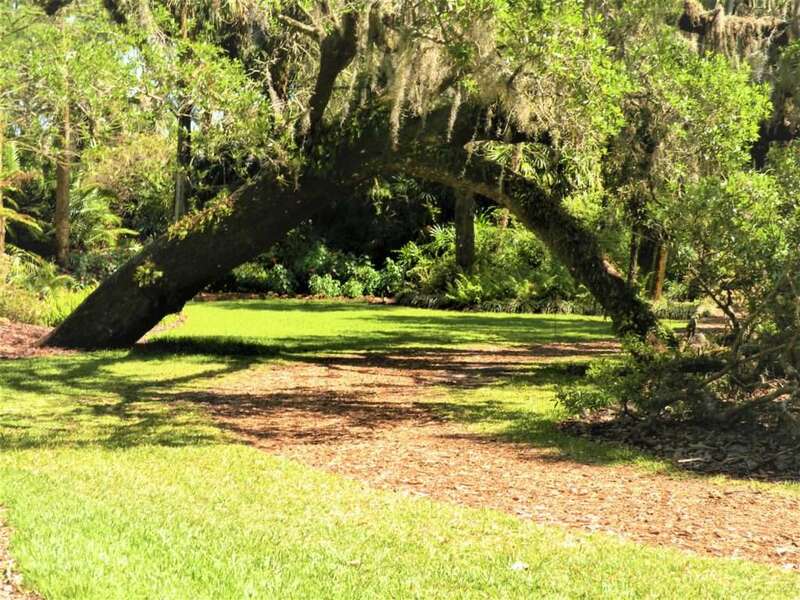 It creates a natural archway over the path. There was a sign that asked visitors to not climb the tree. How did they know that I was thinking about it? The gardens featured countless gorgeous flowers. My mission during this walk was to capture some of the most unique blooms. I had never seen this type of flower before — it’s so textured. 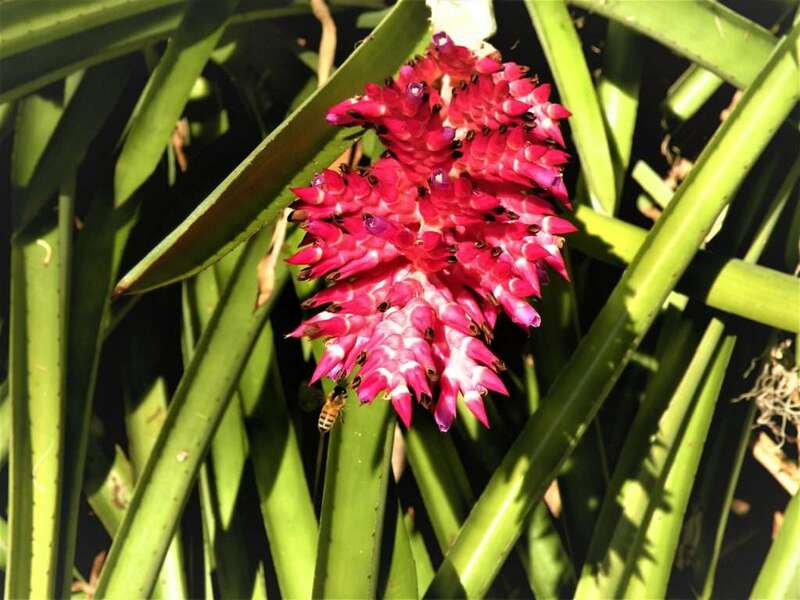 By happy accident, I caught a bee appreciating the flower as well. This flower is so delicate. It reminds me of a trumpet and the colors are so tropical. Throughout the walk, Brad and I were incrementally increasing our elevation. After several minutes of meandering, the winding path dropped us here. You can see for miles. There was an amazing sense of peace at this overlook. As awe-inspiring as this spot was, we still had not reached our feature destination– the tower. We could tell we were getting close. When we turned around, we could see it through some trees. It was also singing its afternoon concert and the music was getting louder with each step that we took. The concert was eerie, haunting and beautiful. It was a unique blend of hymns, classical music and pop melodies. When we were there, the selections included a rendition of John Lennon’s ‘Imagine’. The playlist changes all of the time, keeping regular visitors entertained. The below photo shows the tower and its reflection in the pool in front of it. The tower was intentionally built such that the entire structure would appear in the reflection. 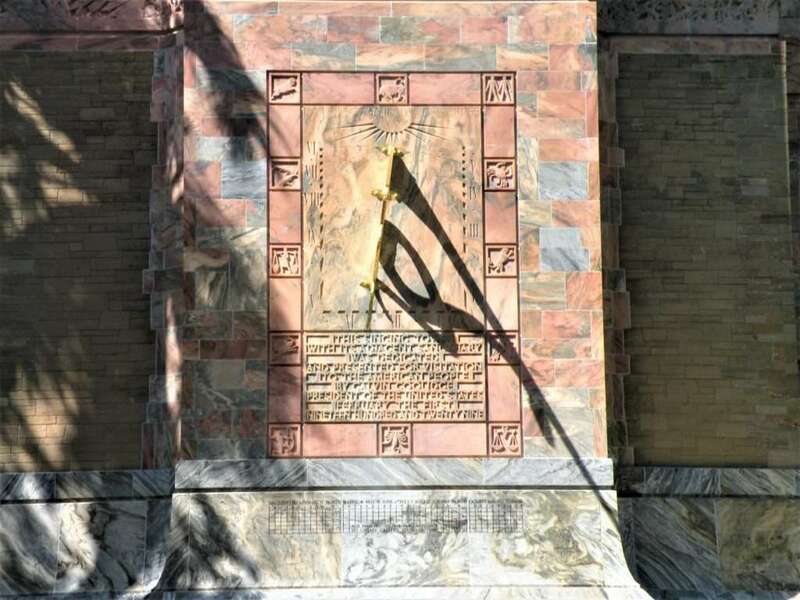 The tower has a steel frame and the exterior features a mixture of coquina stone from Florida and marble from Georgia. 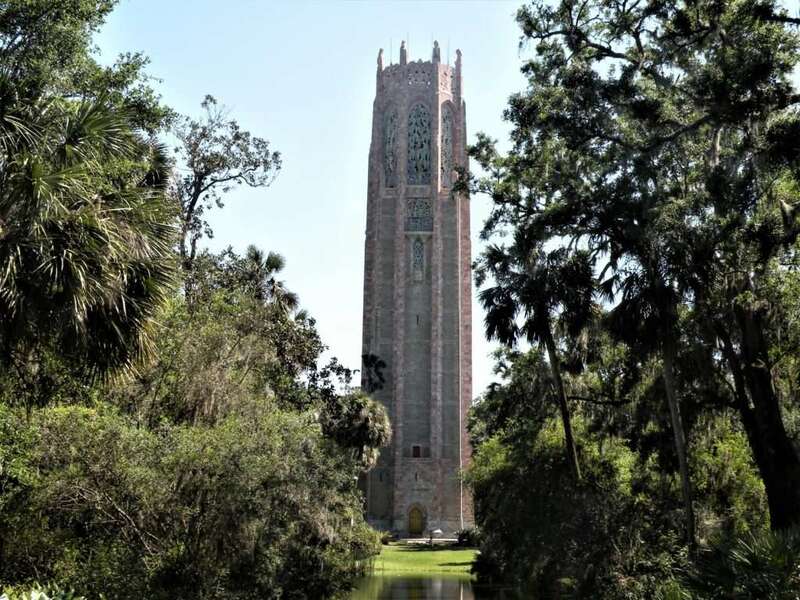 The tower is comprised of 8 different levels including a formal sitting area, a research center/archive room, a storage area, a maintenance workshop, a library, a recording studio, the bells that create the tower’s song and the roof level. Fun fact: Before the estate installed a modern irrigation system for the gardens, water used to come from the top of the tower to the plant life below. 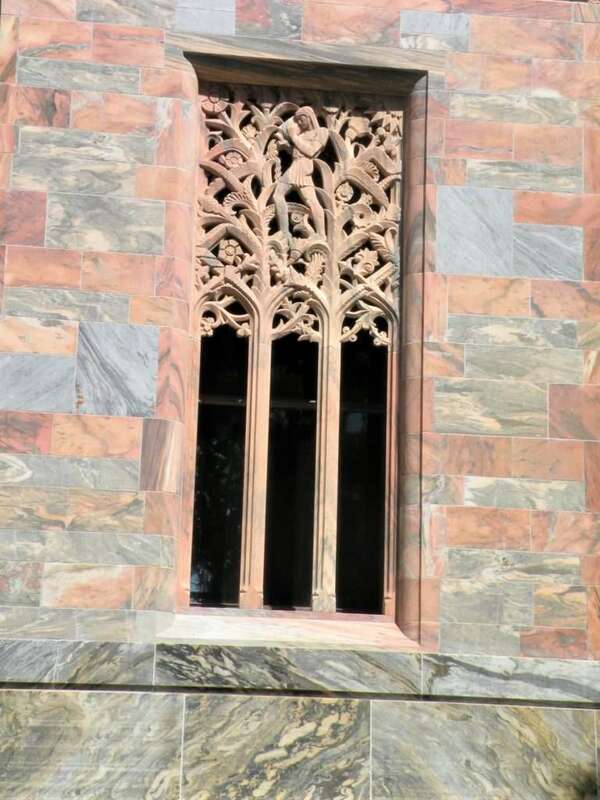 When I zoomed in, I noted the intricate carvings that adorned the entire structure. 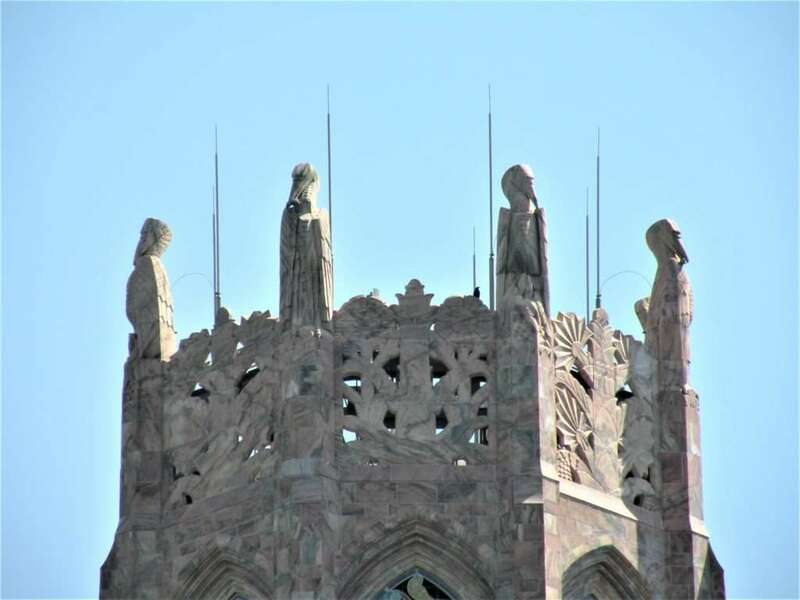 The statues on the tower roof are herons that appear to be standing guard. 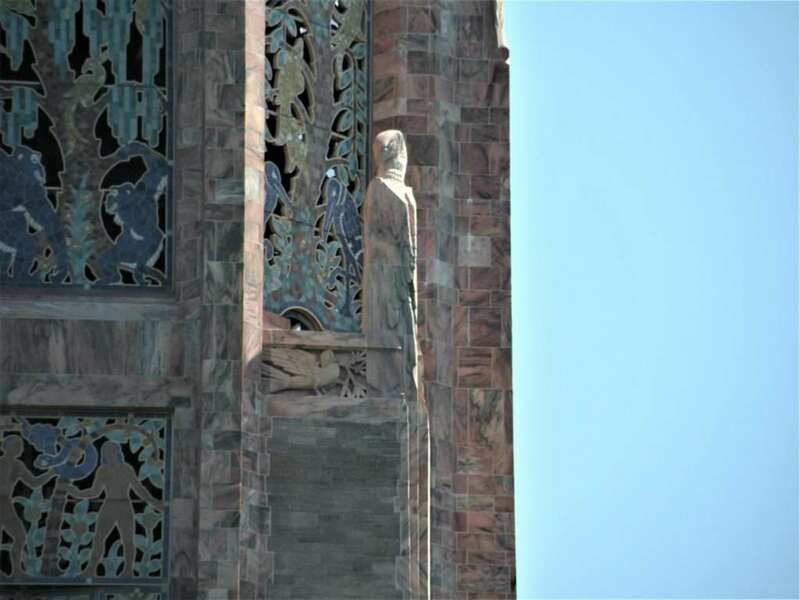 The tower corners also feature the heron statues. Look at the gorgeous marble! The level of detail and craftsmanship is incredible. 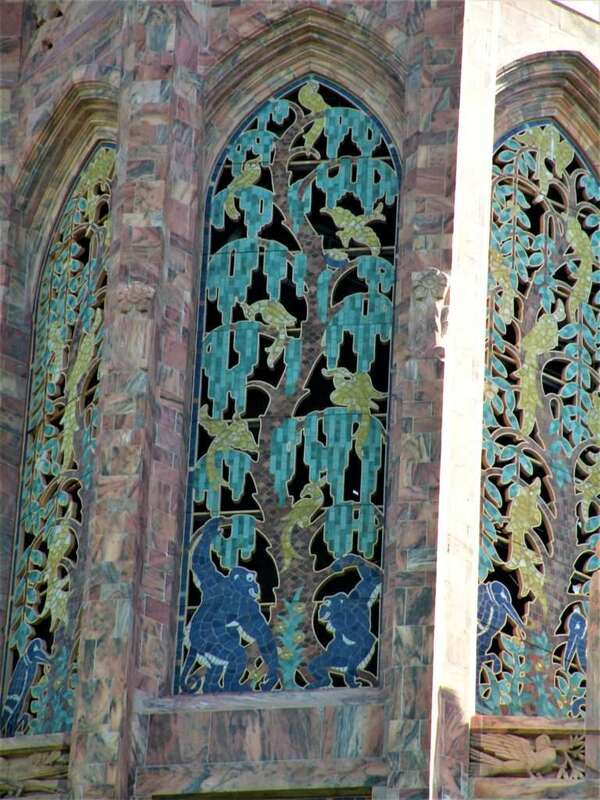 The carvings in the panels typically depict nature–birds, fish and other wildlife. Sometimes, they contain biblical themes– serpents, Adam & Eve. The areas that appear to be black are actually openings for the singing to come through. The music comes from an instrument called a carillon. It’s comprised of 60 bells — ranging in size from 16 lbs. to 12 tons! These bells are only turned once– when they are first made. And unlike other bells, these bells are stationary. The make their sound when they are struck. A musician sits in a sound proof booth (so they don’t go deaf from the intensely loud tones) and strikes keys on a keyboard. Those keys are connected to wires that are connected to striking mechanisms within the bells. The musician can control the volume of each note by how hard they strike the key on the keyboard. Interested in hearing the tower sing? Click here. 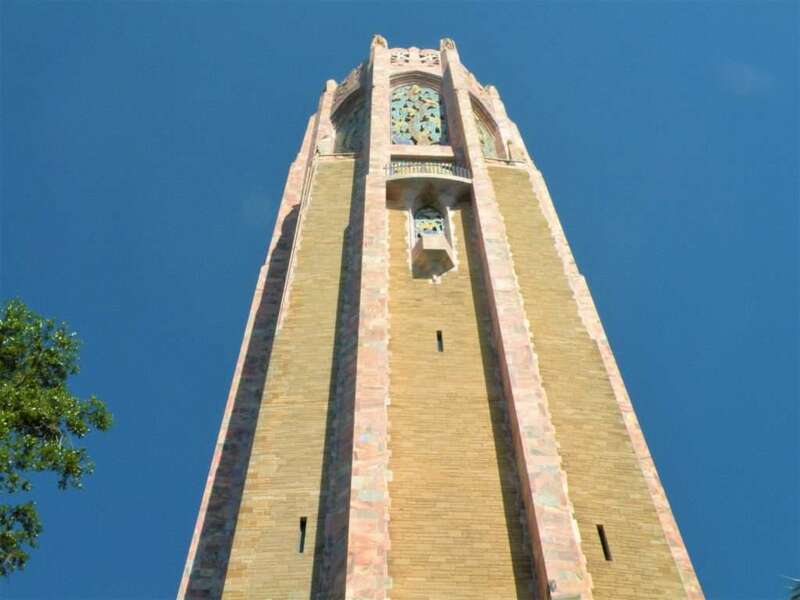 The tower seemed to go on forever– it’s 205 feet tall! The intricate carvings extend all the way to the base on the tower. There were so many surprises as we walked around the building. The designers and architects made every inch visually captivating. 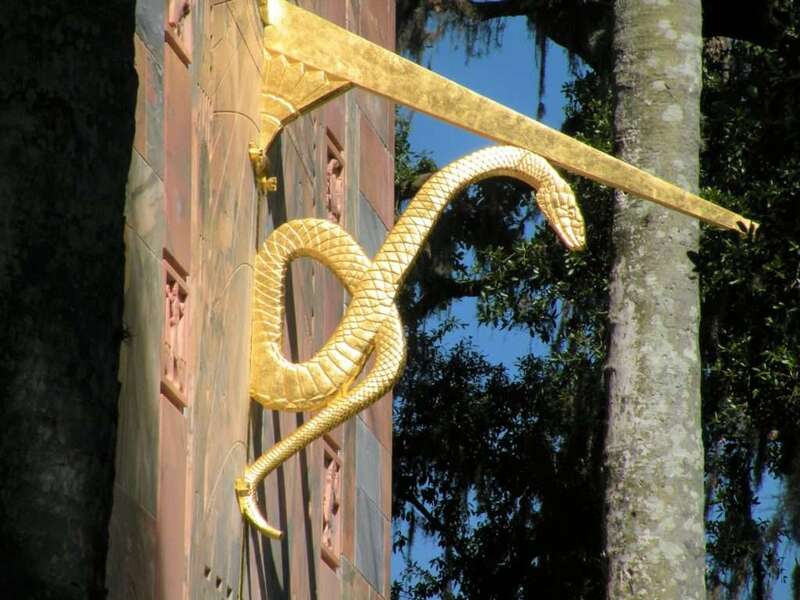 The indicator on the sundial is this beautiful golden serpent. Visiting the tower was something we won’t soon forget. As we walked back down the hillside, we saw more lush landscapes. I was especially taken with the butterfly garden. The large field area was lined with countless types of blooms. We definitely plan to come back. 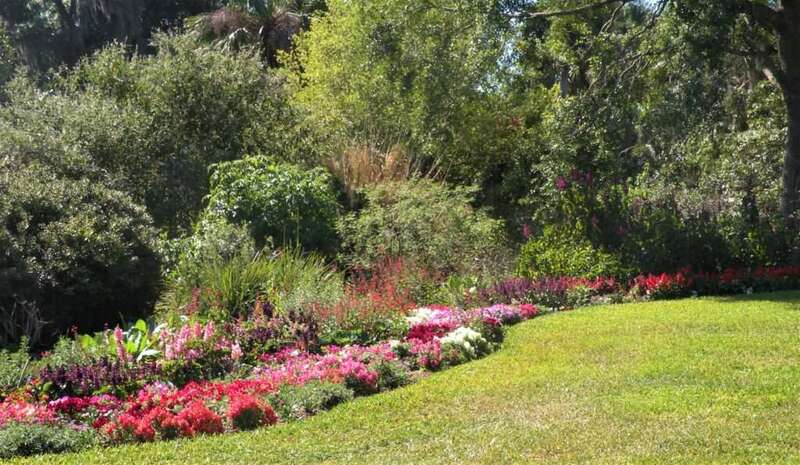 Not only do we need to tour the mansion, there are special gardens in that area of the estate that we did not see. There is also an edible garden that features region specific herbs, fruits and vegetables. It would be wonderful to learn more about the plant species that thrive there so that my own gardening efforts will be more successful. For the two of us, it cost $28 to get in. It was worth the price of admission! 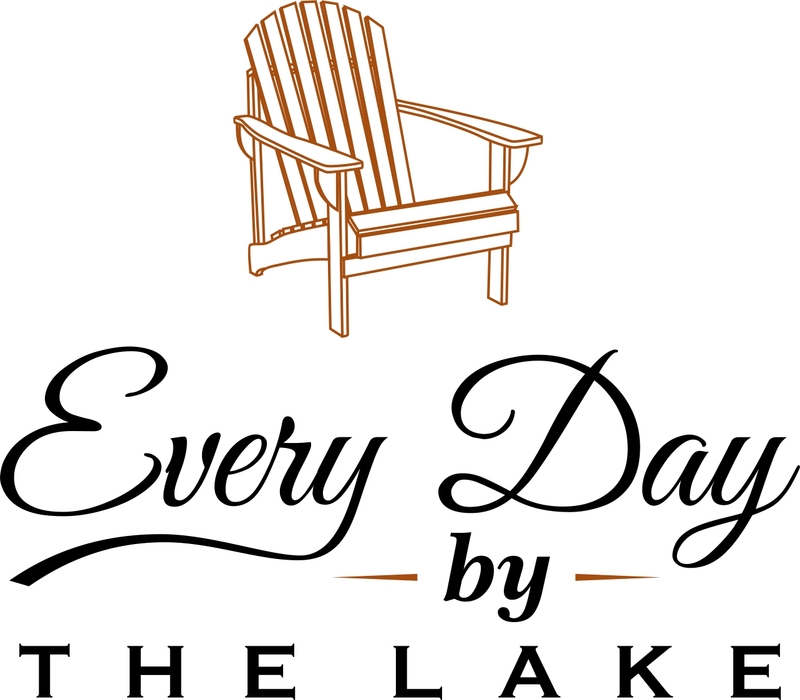 If you find yourself near Lake Wales, FL, I highly recommend a visit! Want to see more adventures? Join us! Beautiful! I’d love to visit some of the gardens you’re writing about! Thank you for sharing your experience. Thank you for reading and commenting! 🙂 I love going to gardens… relatively cheap day out and great exercise! Beautiful! 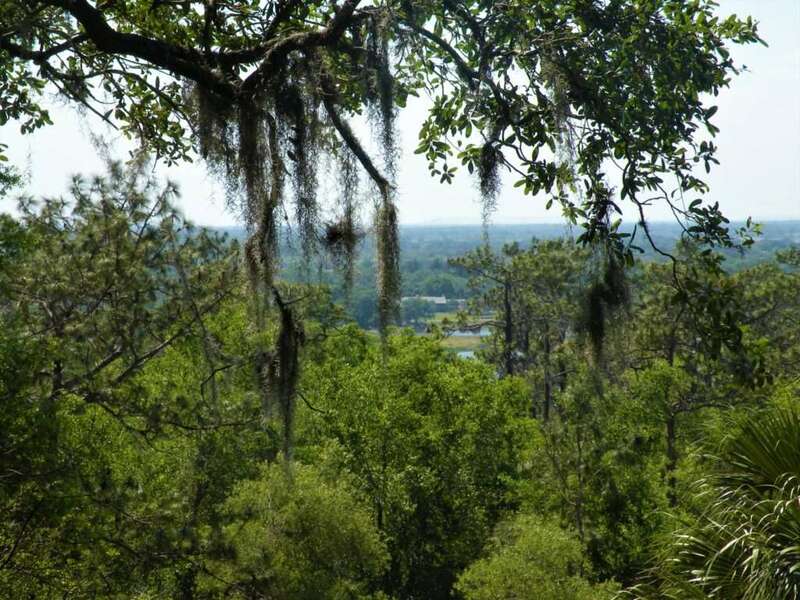 I would love to visit this area of Florida. Thanks for sharing all about it and keep creating your awesome content. So glad we connected. Thank you so much! I would love to get out your way, too. I’ve never really seen states in the interior of the country. So glad to have you in my community!